One of the oldest known forms of lightsaber combat is Form I: Shii-Cho. The Shii-Cho Knight perfects this form, becoming a true master with a blade. 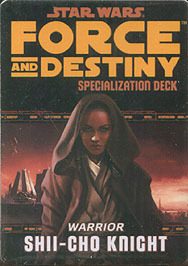 This deck requires the Force and Destiny Core Rulebook and includes cards for all 20 talents available in the Shii-Cho Knight specialization.